Thank You so much for your research and making this map available! Have been searching a very log time for maps like this for my studies of The Bible! Sincere Thank You! Hey brother, do you mind if I use this graphic in a Bible Study handout on the book of Judges? I was also wondering if it were possible to do this on an ongoing basis if I credit you as many of your graphics are relevant to a series that I am doing going through the Bible with my congregation in 2015. Many thanks in advance if this is possible. I understand if not. Feel free to contact me directly if you prefer. No problems at all, Chris. It’s great to hear that the graphics are useful! These resources are awesome! This year our church is going through The Story, an overview of the Bible. 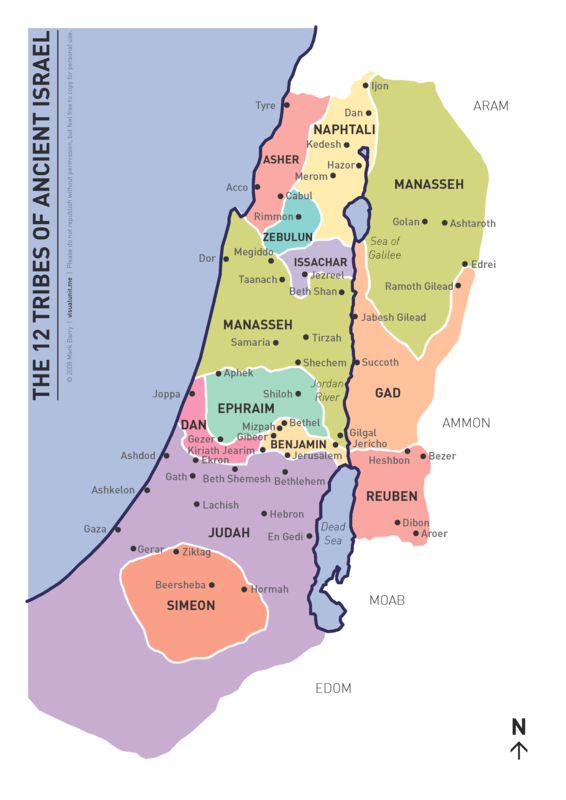 The map of the 12 tribes and the chart of kings of Israel & Judah would be so helpful to show on Sunday morning and perhaps copy in the bulletin. We usually have about 50 adults. Would we have permission to use these? I love your maps! They are so understandable. I will be teaching a class of about 50 ladies. May I make copies of the maps for them to use in the class? My pleasure, Laurel. By all means use the maps for your class. Hello Mark, I would like to use your PDF for our study on Hosea for our women’s Bible Study this fall. So many cities and regions are mentioned in Hosea, that I thought it might be helpful for the ladies to have a visual reference. One more question, Mark. I don’t see Gibeah on the map for Benjamin. Since it is a pivotal place in Judges 21, the birth place of King Saul, and is mentioned several times in other books of the Bible, I’m curious where it might fall in the region of Benjamin? Thanks for your help. IWould like to use your map for an adult special needs Sunday School class. Also, in Gen 34, Judah rescues Simeon by bringing Benjamin to Joseph. I wonder if this is part of the reason Simeon is located within Judah? Feel free to use the map, Michele. You’ve got great resources on this site! I’m doing a video Bible study and wanted to see if it was okay if I used it to show on the video when teaching Joshua 17.